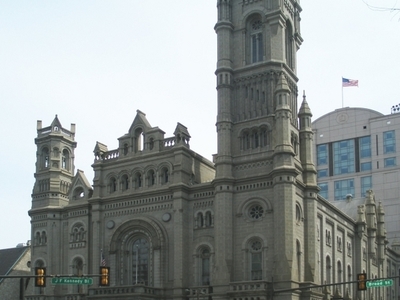 The Masonic Temple, built in 1873, is a historic Masonic building in Philadelphia, Pennsylvania. Located at One North Broad Street, directly across from Philadelphia City Hall, it serves as the headquarters of the Grand Lodge of Pennsylvania, Free and Accepted Masons. The temple receives thousands of visitors every year who visit the ornate structure including its seven ornate lodge rooms, where today a number of Philadelphia lodges and the Grand Lodge conduct their meetings. The massive granite cornerstone, weighing ten tons, was leveled on St. John the Baptist's Day, June 24, 1868. The ceremonial gavel used on that day by Grand Master Richard Vaux was the same gavel used by President George Washington in leveling the cornerstone of the nation's Capitol building in 1793. The bold and elaborate elevations of Norman architecture on Broad and Filbert Streets, especially the beautiful Norman portico of Quincy granite, make it one of the great architectural wonders of the City of Philadelphia. The exterior stone of the building on Broad and Filbert Streets was constructed of Cape Ann Syenite from Syne in Upper Egypt. On May 27, 1971, it was listed on the National Register of Historic Places. It is also a National Historic Landmark. 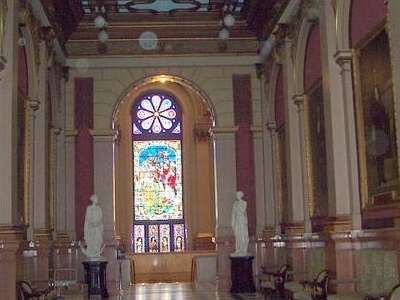 Here's the our members favorite photos of "Historic Houses in Philadelphia". 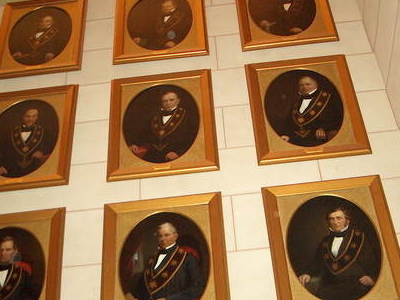 Upload your photo of Masonic Temple!